Peanut butter and banana sandwich. Great for those with gluten sensitivity. For even more peanut-y goodness, mix some Tru-Nut Powdered Peanut Butter w/ Chocolate and dip the bites into there. 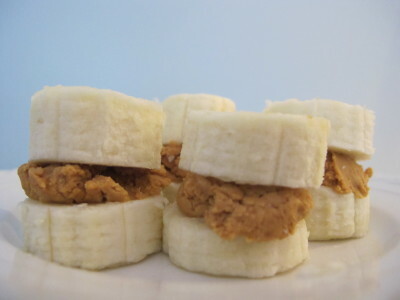 Cut the bananas into discs and spread the Tru-Nut onto the bananas to make a sandwich. For a dessert flavor, dip into Tru-Nut Powdered Peanut Butter w/ Chocolate that has been turned into peanut butter.